Hi guys. Does Mac version V2.19.008 still only support viewport resolution? Curtains should never be drawn. It is much better if they are lightly sketched. 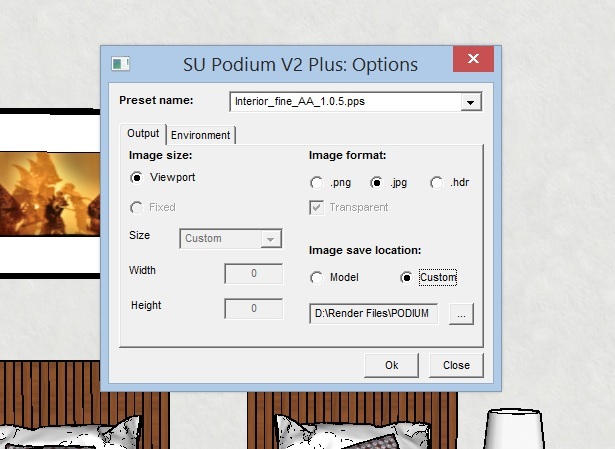 Nope, Podium V2 has always had custom resolution options as I recall. On the download page for the latest beta version it says that for mac it only supports viewport resolution but that this will change with upcoming mac beta versions. If it does support custom resolutions then I'll definitely download it as I've got a load of renders to do and the extra speed will be fantastic! The extra speed is in the geometry processing stage, rather than the render stage, but you can end up with some massive speed increases, particularly with complex models. Hi, I'm using Windows 8.1_sp1 64bit, it says that for Windows it supports all resolution, but why it still only support viewport resolution? Sounds like it hasn't accepted your serial number. You can check this by going to >Extensions>SU Podium V2 Plus>License. But Mr. Bigstick, it say " please do not try to activate this BETA. Your existing V2 Plus license will not work." ? how exactly did you "fix" that?!? thanks! ok, i'll wait for full release... thanks! I am running V2.5.5 on a Mac and my "Fixed" button is not working. Grayed out. Will not let me enter any sizes. Under license it says I am running a full version of the software and shows my license. Hmm, have you restarted SU since entering the licence details? You need to do that. Did you uninstall before you installed the latest version? Although it ought not to be that important, in the past when I've done this, I've found that things don't work unless you uninstall first.